Swallows are one of the many bird species that include Silver City and our region in their travels. The Tree and Bank swallows migrate through here on their journey northward. Cliff, Barn, Violet–green, and Northern rough-winged swallows reside with us throughout the summer to nest and raise their families. These swallows rely on insects for 99% of their food. Barn, Cave and Cliff swallows all build their nests from mud. Cliff swallows build their gourd-shaped mud nests in colonies. Each nest has an opening just large enough for the bird to enter and exit. Barn and Cave swallows’ nests are bowl-shaped and only partially enclosed. The mud that swallows need for building material is found where springs and seeps bubble up from the ground or at the edges of earthen cattle tanks, ponds or stream banks. Despite our dry climate, we do have mud available for swallows to construct their nests. The birds carry tiny pellets of mud in their beaks and form them into the correct shape. It can take 11,000 mud pellets to construct one nest! From three to five eggs are laid and are incubated for 20-26 days, requiring a lot of energy from the parent birds working together to tend and feed the young. From the start of nest building to departure of the young (fledglings) takes from 44-58 days, depending on weather and food availability. Each day, a swallow can consume 60 insects per hour. Insect control is a valuable service that swallows provide to people. In our area, the mosquitoes the swallows eat can transmit diseases, such as West Nile Virus, which are harmful to humans. Swallows are a protected species under federal law. It is illegal to remove nests that birds are occupying. If a nest is destroyed, the swallows must find a new site, which can be very hard. Destruction of nests directly hurts swallow populations and thus is a danger to the species’ ability to thrive. Although bird droppings can be viewed as a nuisance, there is no evidence that swallow droppings in our region carry any disease that affects people. Mud nests do not damage most building materials, despite statements to the contrary from some commercial sources that sell bird repellents. Sometimes swallows are attracted to places inconvenient for people, such as above the doorway of a public building. Installing “swallow guards” above the doorway can prevent nesting in these areas. Mesh netting or lengths of plastic or metal spikes can deter nest building. Southwestern New Mexico Audubon Society is a chapter of National Audubon Society, Inc. and prepared this fact sheet. Barn swallow photo (front) by Elroy Limmer, all other photos are in the public domain attributable through Creative Commons. In May of 2017, we were shocked to ﬁnd the university maintenance crew destroying Cliﬀ Swallow (CLSW) nests built under the overhanging rooftops with a high power spray hose. We spoke with the SWNM Audubon Board and members and a plan was devised. In a meeting with the university president, we encouraged them to place exclusion barriers in high pedestrian traﬃc areas to keep the walkways free from bird droppings. Gratefully, they readily agreed and attractive red brick-colored metal barriers were erected and no nests were taken down in 2018. Volunteers from SWNM Audubon conducted weekly surveys of the buildings on campus to determine which were the favored locations of the CLSW. We also were curious as to how many nests would be successful in a single season, which would give us an estimate of how many CLSW fledged. Armed with binoculars and data sheets the team set off to observe the graceful birds. From May to September we were pleased to witness the birds’ entire breeding cycle of building nests, incubating eggs, feeding nestlings and finally watching the skies fill with new life. Campus structures most used by the birds were Miller Library, estimating to have fledged 396 young and the back of the Phelps Dodge building, producing 87 young. Since CLSW are colonial, being present at the exact moment the young leave the nest is extremely challenging. To remedy this, we took an estimate of how many young left each nest. CLSW lay an average of 3 eggs per clutch and so we used this number to determine an average of how many fledged each nest. The campus as a whole produced an impressive 606 young Cliff Swallows! B3 = Bird, Butterfly and Bee Friendly! 1 tbl mild soap in 1 cup vegetable oil. Or, try commercially-available less toxic insecticides; Neem oil, Diatomaceous Earth, and Safer®Brand products. 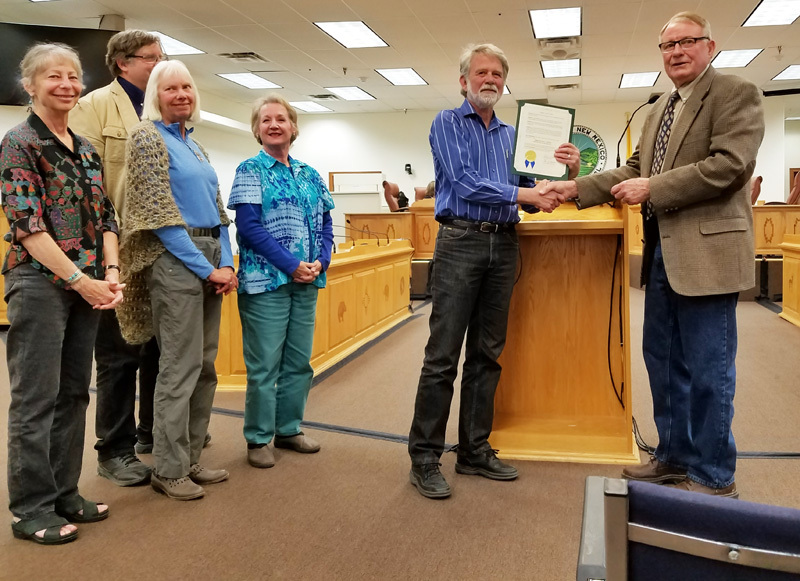 Mayor Ladner presents the proclamation at a Town of Silver City Council meeting declaring Saturday April 21 as Bird, Butterfly and Bee Friendly Silver City Day.